Witness Theater student participants and Mrs. Sanders attended a luncheon hosted by New York State Assemblyman Dov Hikind, together with Nachas Health and Family Network, to pay tribute to the Dominican Republic for its humanitarian efforts on behalf of hundreds of Holocaust survivors during World War II. The Dominican Republic was one of a few countries that were willing to accept Jewish immigration during the war, and ultimately approximately 1,000 European Jews settled in Sosua on the northern coast as well as in Santo Domingo. Featured speaker Abraham Foxman, National Director Emeritus of the Anti Defamation League, world-renowned leader in the fight against anti-Semitism, bigotry and discrimination and Assemblyman Hikind inspired everyone with their commitment to honoring the survivors and remembering and acting upon the lessons learned from the Holocaust. 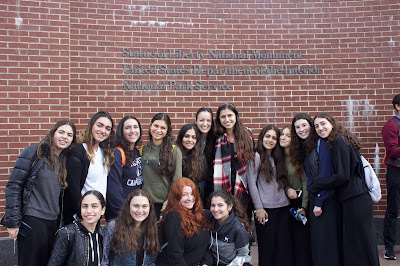 Inspired by learning about the origins of our ancestors in our Jewish History classes, the entire senior grade took a trip to the Statue of Liberty and Ellis Island on Wednesday October 25th, while the rest of the school was taking their PSATs. 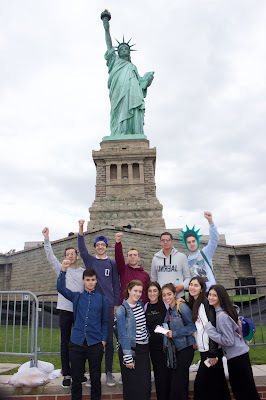 The day began with the students arriving at the ferry, which took us to the Statue of Liberty. The instant our boat docked, everyone was buzzing with excitement. For some, riding a ferry was a first time experience, and for many others, visiting the Statue of Liberty was a first too. We were all awed by the size of Lady Liberty, and even more so when we went onto the actual pedestal of the statue, after discovering that our tickets allowed us to do so. Another addition to the morning was an incentive created for us to complete a scavenger hunt handout, rewarding the first 15 students to finish it with extra credit in Jewish History class. Afterwards, we took a second ferry to Ellis Island and were free to roam around either inside the museum or outside by the Wall of Honor. The museum showed many interesting aspects of the immigrants' arrival at Ellis Island. They had to pass health inspections, show proper documentation, and were often intimidated by the registrars. If they failed to complete these requirements, they could’ve been sent back, which was a big fear of immigrants. It was very insightful seeing what they had to go through in order to start living their new life, or what many considered to be the “American Dream,” and many students connected emotionally because it felt as if we were experiencing history itself the exact way it happened to our ancestors. This trip was a fun day, spent with much learning and enjoyment, where students and teachers alike were able to step away from the regular school day and step into a piece of history in a relaxed, fun and easygoing way. 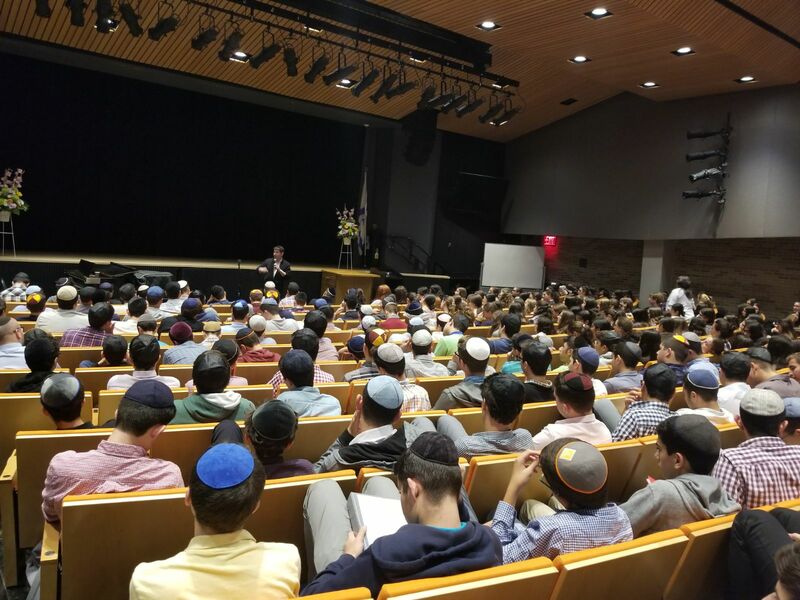 This past Monday, the Yeshivah of Flatbush Joel Braverman High School held their first Yachad-Ohel program of the year. From around 5:00pm, the auditorium started filling up with students and yachad-ohel members. By 5:45pm, there wasn’t a single seat left empty. At first, I thought to myself “wow, so many people need hours!” But once we started playing bingo, I knew each and every student's excitement made me realize that it wasn’t for the hours. After a couple videos and dancing on stage, everyone went downstairs to the gym to let loose. From the second you walked in the room, you felt the excitement all around you. Everyone was dancing, jumping, singing, and having a great time. Nobody wanted the night to end, but once we sang Hatikvah, we calmed ourselves down and sang with achdut. We then ate pizza together to end off one of the most amazing nights ever. 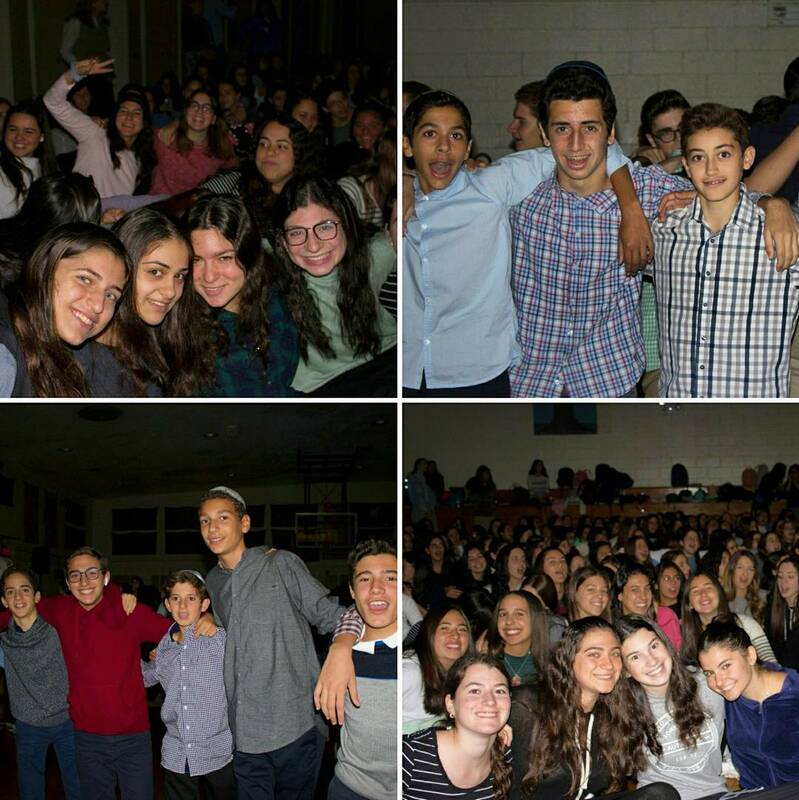 The amount of people there was overwhelming, and the amount of chesed that was performed was uncountable. Thank you for Rabbi Besser for inspiring us all. In honor of Rosh Chodesh Cheshvan, on Friday, Rabbi Besser planned a kumzitz for the whole high school. Being a freshman, I was kind of nervous but also very excited for this event. I heard that almost all high school students love to participate in the Rosh Chodesh kumzitz and my whole class could not wait. 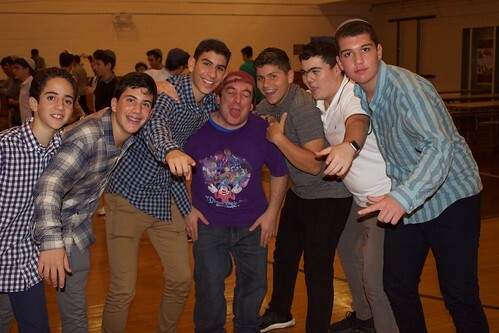 When we were told to go down to the gym for the kumzitz, the excitement was flowing throughout the entire school. This was the first kumzitz of the year so Rabbi Besser started the program off by explaining the concept of achdut (unity). He said that all the Jewish people are one nation and when one of us is hurting we are all hurting. He said we should all be there for each other no matter what. He then showed us a short video of a young man, Max Steinberg, who as an American joined the IDF and gave his life for Israel while fighting in the Gaza war. This gave the whole room a feeling of sadness and we then understood what it means to be one whole Jewish nation but also one big family. We took our emotions and turned it into one unified group singing many songs. Eventually we started locking arms, making circles, and swaying. The whole room was dancing, singing, and feeling united. 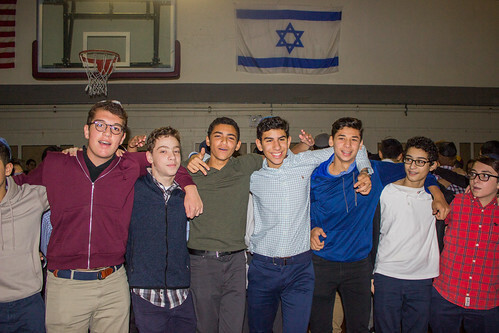 This program impacted me and made me feel truly connected to the school as a whole but also to the Jewish people. Our Pathfinders Program launched an alumni speaker series for students to hear from professionals in the field. Our first speaker was Dr. Aaron Berger, who spoke to students about being a cardiologist. When you think of athletic teams for city schools, surfing is not among the first sports that comes to mind. 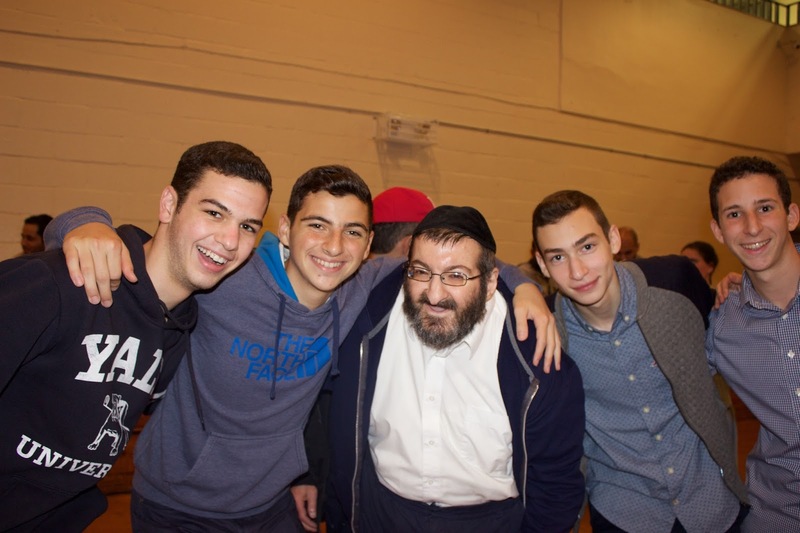 But for one Yeshivah of Flatbush Joel Braverman High School student-athlete, that is right where he feels most at home. 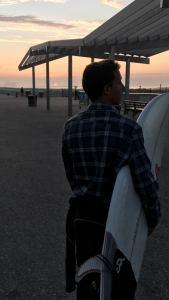 So, when the Northeast Regional Surfing Championships were announced and slated for the nearby New Jersey shore, he reached out for the opportunity, took to the waves on Sunday, 10/15, just off the beach at the North End Pavilion of Spring Lake, NJ – and did not disappoint. Sophomore Joe Tawil has been surfing for much of his life, spending many hours riding the waves on the shores close to Deal, NJ as well as at nearby Rockaway Beach, not far from his home in Brooklyn. When he learned that there are competitions for high school students, he was eager to test himself against some of the area’s best. The National Scholastic Surfing Association (NSSA) is the highest profile amateur competitive surfing association in the United States. 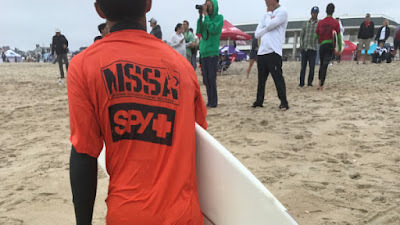 The NSSA promotes the qualities of discipline and competitive excellence while supporting the merits of academic achievement to young surfers. The Northeast Region pooled student-athletes from a variety of schools in the New York/New Jersey area, ranging from public to prep to parochial schools (Flatbush would be considered part of the latter group). Tawil opened the day surfing in men’s heat number 23 (out of 28). Each heat consisted of 6 surfers from different schools, with each one providing its group of surfers 15 minutes to catch as many waves as possible in an effort to show their skills to the judges. After waiting what seemed like an eternity, Tawil, in his orange competition jersey over his wetsuit, paddled out with his competitors from schools such as Shore Regional, Rumson-Fair Haven, Holy Spirit, Morristown-Beard and Wall Township to catch his first wave. By the end of the heat, Tawil had impressed the judges, advancing to the next round! 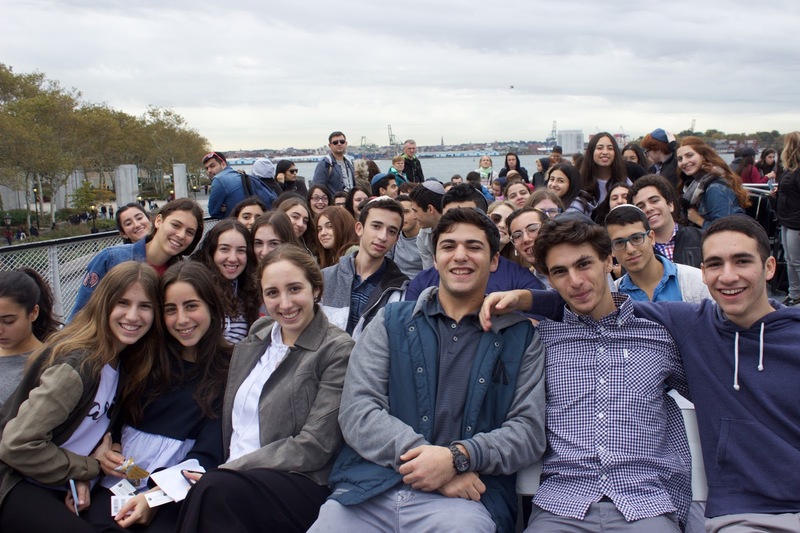 It was also great to hear the name of the school – “Yeshivah of Flatbush” – ring out across the beachhead as Tawil advanced in the competition. How about that?! 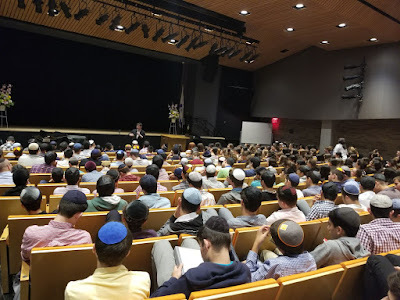 On the Thursday before Yom Kippur, Rabbi Benzion Klatzko addressed the Yeshivah of Flatbush Joel Braverman High School student body and faculty for our annual Teshuvah Assembly. Rabbi Klatzko arranges over 300 Shabbat meals a week for people who need it. 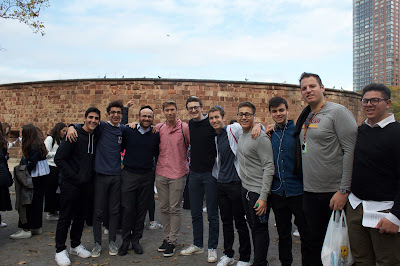 He also created a website, Shabbat.com, which connects over 10,000 Jews over 144 countries He also discussed how we have to prioritize our responsibilities- as a student, teacher, father, mother, son, daughter, Jew, athlete, musician, writer, etc. and know which "hat" sits on top. As a result of his talk, I'm going to try and pay more attention to who I am, and what I can do for everyone else around me, while also looking after myself. One thing he said caught my attention the most: "each one of you could have a kid that would say 'because my parent is brave and strong, it made an impact on everyone and everyone is a better person because of my parent." We have to realize what we say and what we do, and appreciate everything around us. In order to do that, we must know who we are. I'm thankful for the message that Rabbi Klatzko left us, because now I feel I will be more observant of what I do and how I act around others. 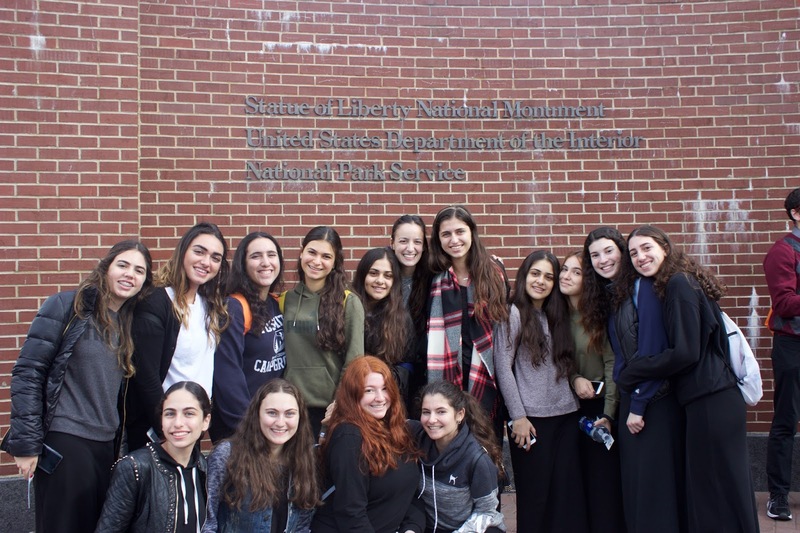 A new initiative at Yeshivah of Flatbush Joel Braverman High School called the Israel Institute, headed by Mr. Rothbort, streamlines all of our school’s Israel-related programs under one umbrella. 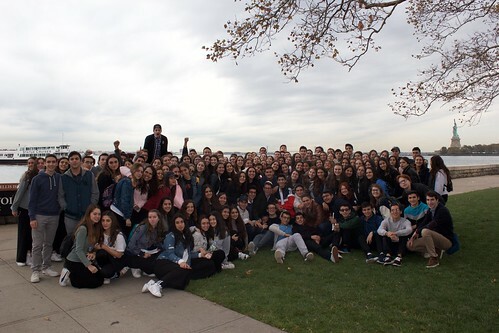 The Israel Institute includes the Israel Activism commission, Yom Hazikaron and Yom Ha’atzmaut programming, AIPAC lobbying, and Israel guidance. The idea is for these clubs and events to become more open to our student body and to the community as a whole. Mr. Rothbort said his goal is to promote the Yeshivah’s and community’s modern Orthodox Zionistic values. Israel Institute Newsletter will be published 4 times a year and contain a section highlighting a historical event relating to Israel, a recommended reading section and political cartoon. Page 2 will include a map of Israel and will highlight 4 -5 news story impacting Israeli society.